Have you been to a super cool party lately? Meet Josie, she’s 11 and if she is any indication of our future, it is in good hands! Jose had a Random Acts of Kindness birthday party. 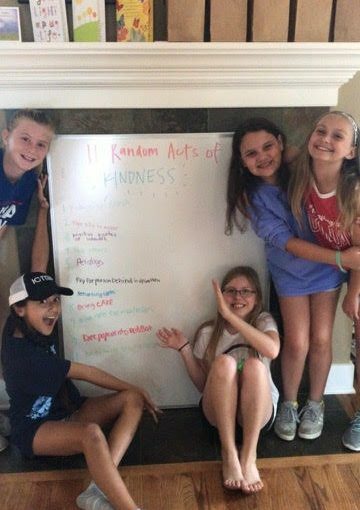 Inviting a handful of friends with instructions to bring nothing more than suggestions for what acts to do, this young philanthropist set out to make Kansas a little bit happier! This small but mighty group of girls had a great afternoon! Among other things, they sidewalk chalked positive messages outside the library and taped bags of popcorn to the Redbox movie vending machines. They brought cookies to the Police Station and flowers to a nursing home. When their 11 acts were completed, they celebrated some more with cake and ice cream. When I heard this story from an audience member (Josie’s very proud mom Devon), I was so moved. Imagine the impact not only on the receivers of the kindness, but on the other children at the party contributing to all this goodness. One thing I say about personal development, if you hear a way cool idea – steal it! Use it! Make the world a better place with it! Whether it’s with your partner, your family, your friends or co-workers; whether it’s to celebrate something special or just to celebrate life, would you consider organizing a Random Acts of Kindness outing? I’d be happy to come!! Personally, I can’t wait to plan my own! Making a party out of Random Acts of Kindness, what a cool way to live Your Life, Unlimited! This entry was posted in Happiness, Leadership, Love, Newsletters, Personal Growth, Positivity and tagged e-news, Inspiration, leadership, Love Everywhere, positivity, Your Life Unlimited. Bookmark the permalink. Previous Previous post: Do you like your own company?